The aim of this study was to investigate how the effects of compound probiotics modulate the gut microbiota, short-chain fatty acid (SCFA), body composition, serum and liver lipids, and inflammatory markers in non-alcoholic fatty liver disease (NAFLD) rats. Twenty-four male SD rats were randomly divided into 3 groups: normal control group (standard feed), high-fat diet (HFD) feeding group (83% standard feed + 10% lard oil + 1.5% cholesterol + 0.5% cholate + 5% sucrose), and compound probiotics intervention group (HFD + 0.6 g × kg−1 × d−1 compound probiotics). The microbial population was assessed by 16S rDNA amplification and sequence analysis. Body composition, serum and liver lipids, serum inflammatory markers, colonic SCFAs, and relative proteins were assessed. The results showed that compound probiotics significantly reduced body weight, visceral and total fat mass, and the levels of hepatic TC and TG and serum TG, FFA, ALT, LPS, IL-1β, and IL-18 (P < 0.05). The proportions of TM7 phylum (0.06 vs 1.57%, P < 0.05) clearly increased, while that of Verrucomicrobia phylum (5.69 vs 2.61%, P < 0.05) clearly decreased. 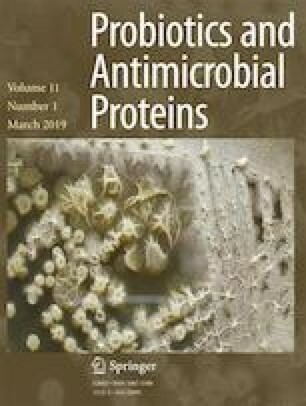 Compound probiotics also increased the representation of Ruminococcus genus (0.95 vs 1.83%, P < 0.05), while the proportion of Veillonella genus decreased (0.10 vs 0.03%, P < 0.05). The levels of colonic SCFAs and GPR43, NLRP3, ASC, and CASPASE-1 proteins also changed significantly (P < 0.05). Compound probiotics modulated gut microbiota, SCFAs, and their receptor GPR43 in NAFLD rats. These changes might inhibit lipid deposition and chronic metabolic inflammation in response to the insult of HFD. The online version of this article ( https://doi.org/10.1007/s12602-017-9378-3) contains supplementary material, which is available to authorized users. We thank Pinghe Yin, Yang Hu, and Huanyong Li from Jinan University Analytical and Testing Center for technical assistance and Guangzhou Genedenovo Biotechnology Co. Ltd. for providing the methods for partial bioinformatics analysis. This work was supported in part by the National Natural Science Foundation of China (no. 81774165, 81573844), the Natural Science Foundation of Guangdong in China (no. 2016A030313824), Traditional Chinese Medicine Bureau of Guangdong in China (no. 20161065), and the National Health and Family Planning Commission of Guangdong in China (no. A2016583 and A2017228).